The 1st Field Regiment has existed in several incarnations since the establishment of the post Federation Military Forces. In the 1st World War, the 1st Field Artillery Brigade provided field artillery support to the 1st Brigade. It is dealt with in a dedicated entry elsewhere in this site. With the creation of the Militia between the Wars, the 1st Field Regiment was raised in support of the 1st Brigade of the 1st Division. It served throughout WW2as apart of the AMF on home defence duties. The 2nd/1st Field Regiment was raised as part of the 2nd AIF and served with the 6th Division in North Africa and later in the SW Pacific. It has a separate entry elsewhere in this site. After demobilisation at the end of WW2 a period of re-orgnaisation of the new 'Regular' Army took place. The 1st Field Regiment was raised on 25 May 1949 at North Head, Sydney. At that time it was the only regular artillery regiment. 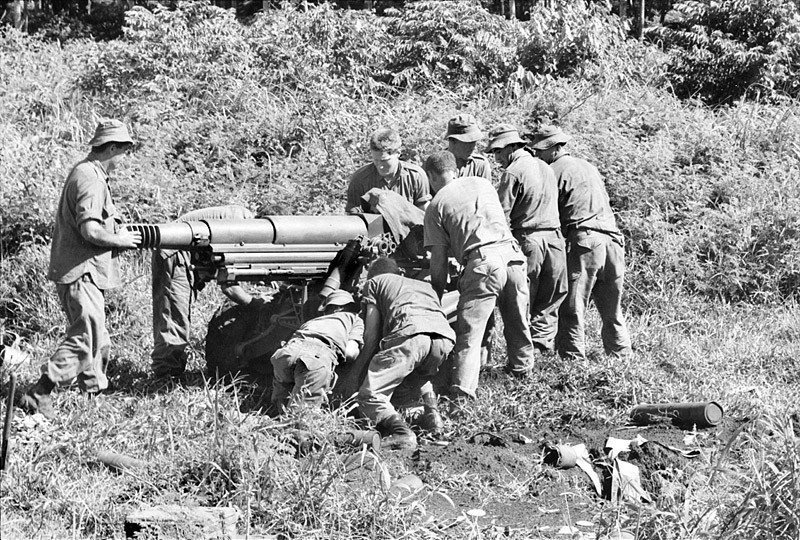 By 1965, on the eve of Australia's commitment of Regular Army troops to the Vietnam War (Advisers of the Australian Army Training team who had been in Vietnam since 1962), the Regiment consisted of 101st Field Battery and 105th Field Battery (Independent), both equipped with 105 mm L5 Pack Howitzers, 102nd Light (4.2 inch Mortar) Battery and a Headquarters Battery. In April 1965 the decision was taken to deploy the 1st Battalion, Royal Australian Regiment (1RAR) to Vietnam. It was clear Australia's existing establishment of Artillery units would not be sufficient to support the proposed level of commitment. A third field battery was added so 1st Field Regiment's order of battle for deployment to Vietnam became 101st Field Battery, 105th Field Battery, 161st Battery, Royal New Zealand Artillery and Headquarters Battery. 1 RAR deployed to Vietnam in May 1965 with fire support initially provided by 161 RNZA; however, in September 1965 the 105th Field Battery arrived to provide additional fire support. With the expansion of the Australian force to two Battalion Groups in June 1966, the remainder of the Regiment, less 101st Field Battery, deployed to Vietnam accompanied by 103rd Field Battery. The US Army added six 155 mm M109 self-propelled howitzers from A Battery, US 2/35th Artillery Battalion which were permanently attached at Nui Dat. On 18 August 1966, the Regiment supported D Company 6RAR at Long Tan, and turned the tide of the battle in favour of the Australians preventing their probable annihilation by a vastly numerically superior force, firing 3,198 rounds from their L5s in three hours of intense combat. In September 1966, 105th Field Battery was replaced by 101st Field Battery and returned to Australia. In May 1967, the Regiment completed its first tour of duty in Vietnam and was replaced by 4th Field Regiment, Royal Australian Artillery. The Regiment, rejoined by 105th Field Battery, relocated to Sanananda Barracks, Wacol in Queensland. The 103rd Field Battery was re-roled as a medium battery and moved to 12th Medium Regiment with WW2 vintage 5.5 inch guns. The remainder of the Field batteries re-equipped with the M2A2 105mm Howitzer during the Vietnam conflict. In February 1969, 105th Field Battery returned to Vietnam for a second tour of duty to be followed by the remainder of the Regiment a month later. On completion of their final tour of duty, the Regiment returned to Sanananda Barracks, Wacol in March 1970. The 1st Field Regiment in the early 21st century is based at Ennogea Barracks in Brisbane, and is the Direct Support Regiment for the 7th Brigade. It is now an integrated Regiment with a Reserve Battery, 104th Field Battery, as part of its establishment. 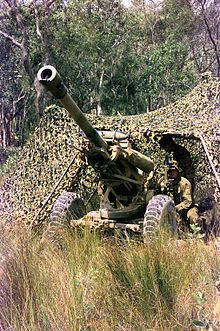 Having equipped with L119 Hamel Light Guns in the late 1980s, in January 2011 the Australian Regular Army field regiments were reorganised in preparation for re-equipment with new guns and battle management systems to each contain three observation post batteries, supported by a single gun battery equipped with 12 guns. As part of this reorganisation the regiments were renamed, with the word "field" removed from their title. Under the new structure each regiment is capable of providing a brigade-level Joint Fires and Effects Coordination Centre (JFEEC) and every observation post batter provieds a battle group JFECC as well as three combat team joint fires teams. Every gun battery now comprises three troops of 155 mm towed howitzers. In 2011 the 1st Regiment received 8 US designed and built M777A2 lightweight towed howitzers to replace its L119 field guns and M198 howitzers, and the Advanced Field Artillery Tactical Data System (AFATDS), which is a fully automated digital battle-management system. In early 2012 it took delivery of the Digital Terminal Control System for observation post batteries. The regiment is based at Barce Lines, Gallipoli Barracks, Enoggera. 2. McNeill, Ian (1993). To Long Tan: The Australian Army and the Vietnam War 1950–1966. The Official History of Australia's Involvement in Southeast Asian Conflicts 1948–1975. Volume Two. St Leonards, New South Wales: Allen and Unwin. ISBN 1863732829. 3. Palazzo, Albert (2006). Australian Military Operations in Vietnam. Australian Army Campaigns Series. 3. Canberra: Army History Unit. ISBN 1876439106.